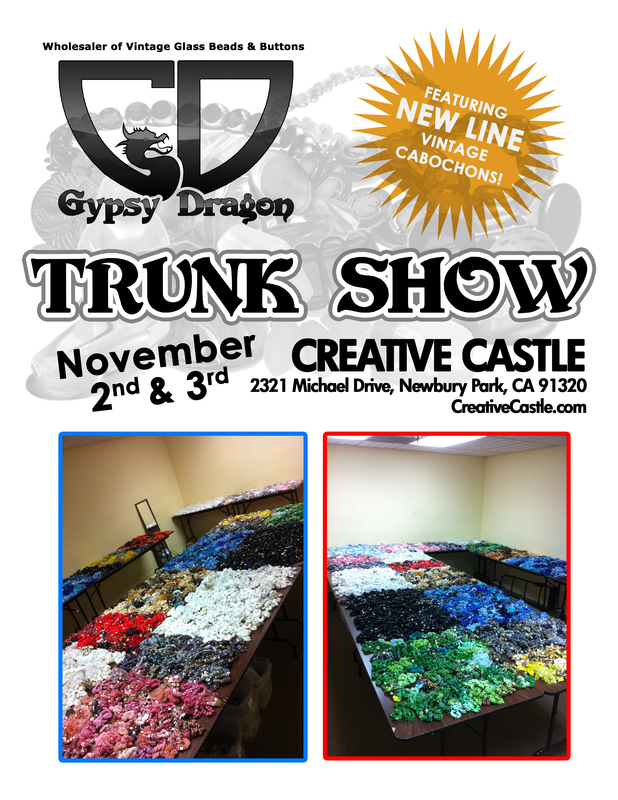 Join us for another trunk show this Friday and Saturday (November 2nd & 3rd, 2012) at Creative Castle in Newbury Park! As always we will be showcasing a large selection of our gorgeous inventory that you can't find anywhere else in the world! CLICK HERE TO DOWNLOAD A FLYER! Our trunk show at San Gabriel Bead Company this weekend has begun! Come meet us for a great deal on one-of-a-kind beads and buttons! As always we will be showcasing a large selection of beautiful glass from around the world, including Germany, Thailand, and China. We are here until Sunday so there is plenty of time left! Greetings bead lovers! Join us at Monica's Quilt & Bead Creations for a trunk show this Friday, February 24th through Sunday, February 26th. We will be showcasing a large selection of our gorgeous inventory of vintage glass beads and buttons from around the world! © Copyright Gypsy Dragon LLC - All rights reserved.